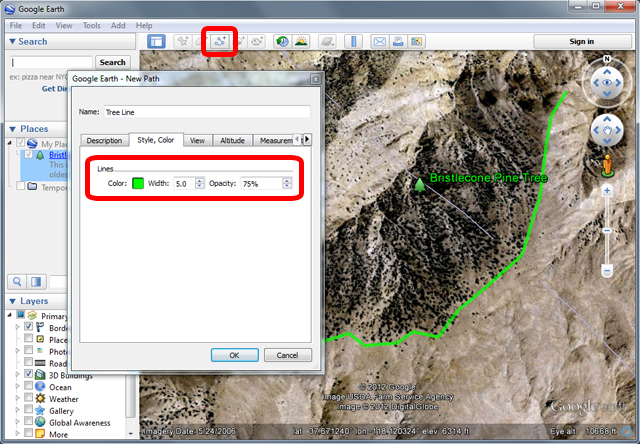 Click the Add Path button at the top left of your map. A New Path dialog box appears, and your cursor changes to . Click on a series of places on the map form a path. Each time you click, a new node is added to your path. You can also click-and-drag to create frequent nodes, which makes a smoother path. In this example, we will create a path marking the tree line. In the New Path dialog box, type in a name for the path in the Name field. 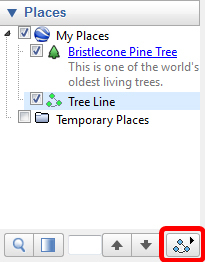 In this example, we typed "Tree Line". Click on the Style, Color tab, and choose a color, width, and opacity for the path. In this example, we choose a dark green color, a width of 5.0, and an opacity of 75%.